Fort Klamath during its heydays. Fort Klamath was a military outpost near the western end of the Oregon Trail, between Crater Lake National Park and Upper Klamath Lake in Klamath County, Oregon. It began when Colonel C.S. Drew of the First Oregon Cavalry was sent in 1862 to scout a location for an Army post to protect settlers in the new West. The location, about a mile southeast of the present community of Fort Klamath, Oregon, was chosen for its abundant water, timber, pastureland, and beauty. The next year, Troop C of the First Oregon Cavalry arrived and began building the fort, which soon including a sawmill and some 50 buildings. However, criticism for its location was almost immediate as it was generally thought that the fort should have been located further to the south to protect immigrants on the Applegate Trail, the southern route of the Oregon Trail. Except for during the Modoc War of 1872-73, soldiers at the fort spent most of their time peacefully building roads and supervising the Klamath Agency Indian reservation. Modoc War, which resulted when the Modoc were forced onto the Klamath Reservation with their enemies the Klamath and Yahooskin, and a group of more than 300 Modoc, led by Kintpuash, fled the reservation. When the U.S. Army went after the Modoc to return them to the reservation, the Modoc War erupted in full force. When it was over every surviving Modoc Indian who participated in the conflict was marched under guard to Fort Klamath. Six Modoc leaders, including Kintpuash, or Captain Jack, were shackled and held in the guardhouse, while 140 other Modoc men, women, and children were confined to a small stockade. On October 3, 1873, the Modoc leaders were executed following their conviction for killing General Edward Canby and other members of a U.S. Army peace commission. The remaining Modoc were then exiled to a reservation in Oklahoma or returned to the Klamath Reservation. By the tall of 1889, the fort was the last military outpost in Oregon, but the area settlers no longer needed protection. The decision was made to close the fort. After a harsh final winter with more than 20 feet of snow, the troops of Company I of the 14th Infantry Regiment left the fort on June 23, 1890, and moved to Vancouver Barracks. Due the harsh winter, many of the buildings were damaged beyond repair and much of the wood was carried away by the locals. Other buildings were moved to other locations and the land was given to the State of Oregon to sell. Today, all traces of the original fort are long gone with the exception of the graves of the four Modoc Indian leaders who were tried and hanged at the fort in 1873. However, an eight-acre parcel of land has been designated as a park and museum by Klamath County, Oregon. 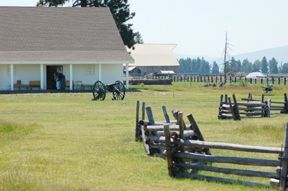 The Fort Klamath Museum is housed in a recreated structure designed after the fort’s guardhouse and standing in the original guardhouse location.